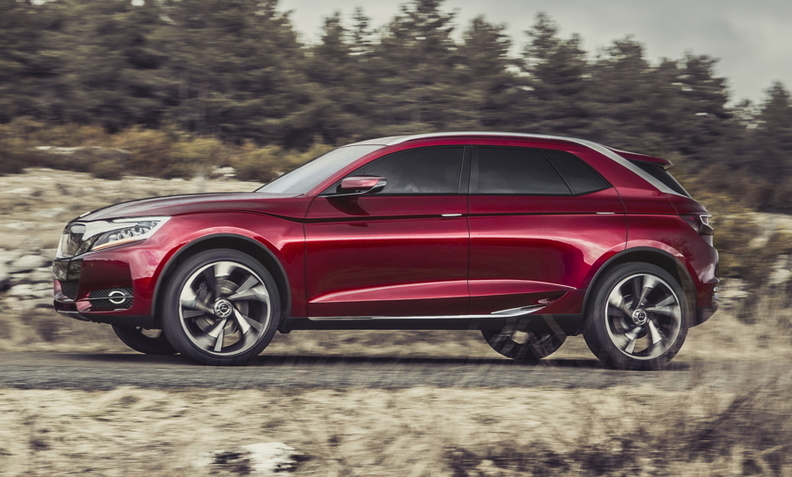 The Wild Rubis concept previews a large crossover for the DS subbrand. The production version of the car will be built and sold in China, where DS already is a stand-alone marque. PSA/Peugeot-Citroen CEO Carlos Tavares wants the company's upscale Citroen DS product line to become a stand-alone brand that can compete with Audi, Mercedes-Benz and BMW. Market watchers, however, have mixed views on whether the ambitious plan will succeed. Commerzbank analyst Sascha Gommel is bullish about the move. "Spinning off DS as a separate brand, which they are already doing in China, is a move that would absolutely make sense," he said. Florent Couvreur, an analyst at CM-CIC Securities, worries that PSA would have to wait a long time until it sees a substantial return on its investment. "It could take 15 to 20 years for DS to become a profitable premium brand like Audi, BMW and Mercedes," she said. Globally, Citroen sold about 123,000 DS cars last year while Audi, BMW and Mercedes each sold more than 1.4 million vehicles. Tavares is not intimidated by the challenge. “German automakers make money mainly because of their premium brands and DS is PSA’s premium brand,” he said during the Geneva auto show last month. Tavares is expected to give a timetable on when DS could become a stand-alone brand when he reveals PSA’s recovery plan this month.